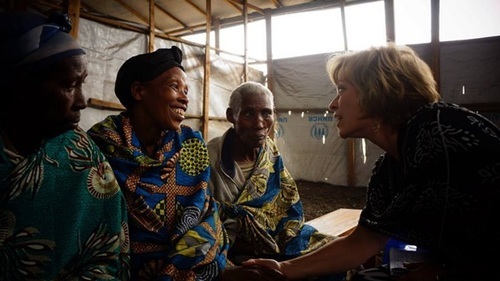 In 2012, Belinda Bauman visited the Democratic Republic of the Congo, where she met a woman named Esperance, a 50-year old mother and widower. During that visit, Esperance told Belinda her story – how rebels had killed her husband while she watched, and how she was subsequently raped within an inch of her life. If her sisters had not intervened, Esperance is sure that she would be dead. After talking to other local women and doing some research, Belinda found that Esperance’s tragic experience was by no means a rarity. Violence against women in war zones has become so prevalent that Major General Patrick Cammaert, United Nations Force Commander for the Eastern Democratic Republic of the Congo, has been quoted as saying, “It is now more dangerous to be a woman than to be a soldier in modern wars.” In the 1994 Rwandan Genocide, nearly 500,000 women were raped in a mere 100 days. This knowledge shocked Belinda, but what shook her even more were Esperance’s subsequent actions. Unable to read or write, she had someone write, “Tell the world,” on a piece of paper, beneath which she put her thumbprint. Since that day, Belinda has declared her mandate to be: “Violence against women in war is violence against me.” She went on to found One Million Thumbprints, or 1MT for short, which advocates for women in conflict zones. Through their partner, World Relief, they help provide counseling, emergency aid, and training on diplomacy and peacekeeping skills to women in the Democratic Republic of the Congo, South Sudan, Iraq, and Syria. But 1MT’s goal is not only to at this site assist these victims of sexual assault, but to help prevent it in the future. UN Women Executive Director Michelle Bachelet said that “If women could be fully engaged in peace building there would be a much lower rate of relapse into conflict.” After receiving counseling herself, Esperance has declared that she wishes to be trained in trauma counseling as well, to help those women who have been through similar traumatic experiences. With the UN’s Resolution 1325, passed in 2,000 more and more women are becoming involved in conflict resolution, peacebuilding, and efforts focused on preventing the re-ignition of hostilities in previously conflicted areas. 1MT and its partners believe that this is the path toward peace between nations and safety for women worldwide. Among the other group members are Chelsea Hudson, blogger and founder of Do A Little Good; Laura Breu, former Peace Corps member and current nursing student at the University of Nevada, Reno; Leia Johnson, president and co-founder of Somebody’s Mama; and the climbing group’s only male member, David Lippiatt, founder and CEO of WE International.